I have to admit this: I’m a plain cake girl. While I feel a sort of awe for many-tiered cakes with smooth frosting swooped up toward the edges, I feel a bit tired when I look at them too. Having only produced multi-layered cakes with crumbs smooshed into the frosting, bare in patches, the cake a bit slumping on one side, I know that it would take hours to make camera-ready cakes. For some of my friends, that work is like meditation, a soothing solo experience in making something gorgeous in slow steps. For me? No thanks. I’m less and less interested in camera-ready tableaus these days. Life’s too short to worry about perfection. Besides, the cake that has a crumb layer, plus another unblemished layer of thick buttercream on top for the look of it? Too much frosting for my taste. If I’m going to eat cake, I want to eat cake. Years ago, I tried to come up with a chocolate cake that kept my interest past a few bites. 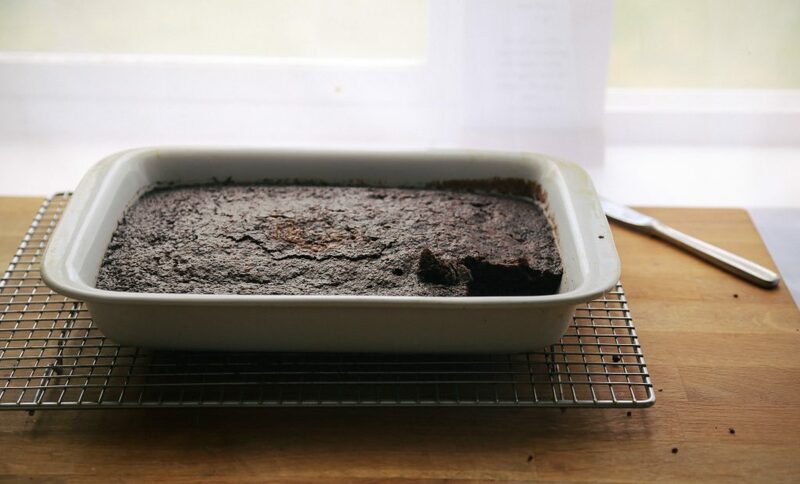 I wanted a great one-bowl chocolate cake for our cookbook, Gluten-Free Girl Every Day. Dan loved the week that day after day he came home from cooking at the restaurant and found another chocolate cake on the counter, waiting for his fork and approval. Me? By the time I landed on day three, I had moved onto another dessert for that chapter instead. (The peanut butter and jam bars might be one of my favorite dessert recipes.) Chocolate cake — whether I used butter or coconut oil, hot coffee or espresso powder — every day pretty much tasted so much the same. Every bite, chocolate cake. I know that some of you might think me crazy for saying this, but I wanted a little more variety. A few surprises. Years later, I discovered what I was missing. Mayonnaise. A friend of ours asked if we could make a family favorite cake gluten-free for a special occasion. Of course. It’s what I love to do most. It’s an old recipe, one she had written out by hand on a piece of old Microsoft stationery, with chocolate smears across some of the word. And the top of the list caught my eye immediately: mayonnaise and shortening. Well, I’ve never made this before. It ought to be interesting. Turns out that the recipe isn’t her family’s secret. This chocolate dream cake is an old tradition. It’s a recipe that probably originated in the Depression, when fresh eggs were scarce and more expensive in cities than they are today. And of course, mayonnaise is made partly of eggs. This modern recipe uses eggs, so it has the structure and staying power that the protein in eggs provide with the slippery richness of mayonnaise. Mayonnaise adds a creaminess and a moistness that I never could find in my chocolate cake forays. And since we didn’t use butter and poured in non-dairy milk (we preferred almond milk here), this cake is dairy-free. 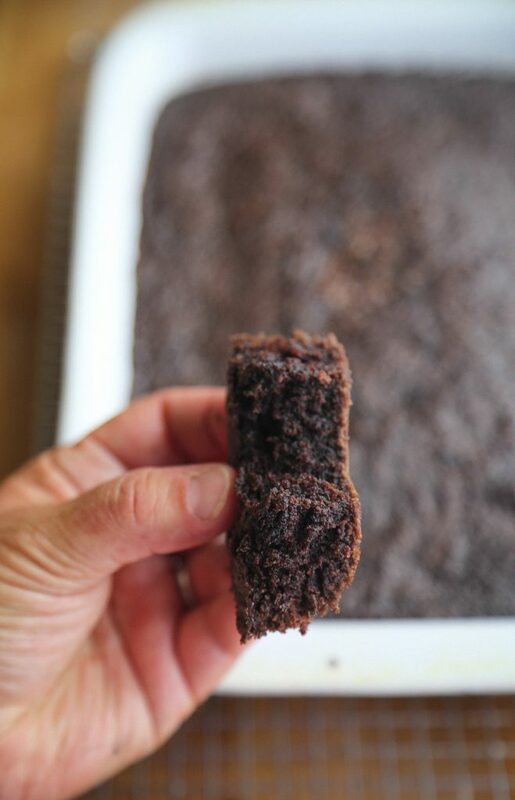 Think of this cake as a deeply flavored tender brownie. Eat a piece with your fingers and lick off the soft chocolate crumbs after. This cake doesn’t require frosting or any embellishment. It’s a simple afternoon pleasure, a snacking cake that makes the day feel decadent. Our friend loved it. Our kids loved it. Everyone who came to the house this day of testing loved this cake. It disappeared pretty quickly. Looks like I’ll be making another gluten-free chocolate dream cake soon. This is a one-bowl cake, full of flavor and so easy to make. It’s the chocolate cake I tried to make 6 years ago. Recipes like these are why we created our gluten-free all-purpose flour. You don’t have to think here. Just weigh it out and put it in the bowl. But if you have teff flour around the house — like we do here — then make 1/4 of the flour’s volume teff instead. That’s going to be a very chocolatey taste. If you want to intensify the chocolate taste even more, use 1 cup of strong dark coffee in place of the water. If you know you will be serving it to kids, you might want to use decaf instead. Prepare to bake. Heat the oven to 400°. Grease a 9x13x2-inch baking pan with the fat of your choice. Combine the dry ingredients. Whisk together the flour, sugar, baking soda, salt, and cinnamon in a large bowl. Set aside. Boil the mayonnaise and cocoa powder. Set a small pot over medium-high heat. Add the mayonnaise, shortening, hot water, and cocoa powder. Whisk them together until everything has broken down to a thick liquid. Bring the liquid to a boil. Turn off the heat. Pour the hot liquid into the flour and sugar bowl. Stir them together. Finish the batter. Add the non-dairy milk, eggs, and vanilla to the batter. Stir everything together with a rubber spatula until the batter is thick and glossy, with no visible flour remaining. Pour the batter into the prepared pan. Bake the cake. Bake the cake until the edges have started to slightly pull away from the pan and a toothpick inserted into the center comes out clean, about 35 minutes. Remove the cake from the oven. Let the cake cool for 1 hour before cutting it up and diving in. Feel like playing? I haven’t tried it yet, but if you want to make this cake vegan, use a vegan mayonnaise. Then, replace the eggs with 4 ounces of aquafaba. (Haven’t read about this yet? It’s the liquid at the bottom of a can of chickpeas. Best egg replacer I’ve ever found.) Let us know how that works for you. The original recipe called for buttermilk. We used plain almond milk and liked the cake. But if you want, you can “buttermilk” that non-dairy milk by stirring in 1 teaspoon of lemon juice and letting it sit for 15 minutes before making the cake batter.